The Christmas countdown is on! In between baking cookies and ugly sweater parties, there is always the difficult task of finding the perfect gift for all of the people on your list. This year we have done some of the hard work for you by searching through piles of possible presents to pick out our top 12 favorite gift ideas this holiday season. This year, as a thank-you to our loyal customers, we are offering 10% off all of our gift idea items that are available in our online store with coupon code 12DAYS! 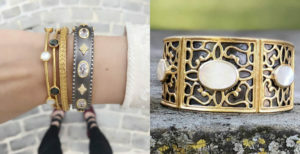 There is no denying it- bracelets are one of our favorite things. Unlike necklaces and earrings, which we put on for others to see, we get to look down at our wrists all day and get a smile from seeing that touch of sparkle. 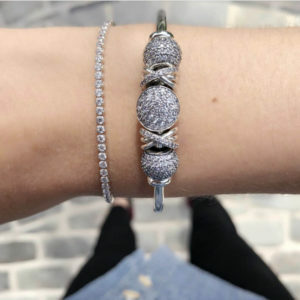 For those rushed days when we have to grab our jewelry and go, we need a signature piece that makes a bold and beautiful wrist statement without the effort of crafting the perfect stack. A good statement bracelet is a must-have piece, and the first of our 12 gifts picks this Christmas- here are some of our favorites! We love showing off our hometown pride with the beautiful Star of Bethlehem and Moravian Star emblems. Whether the star is cut from simple silver or adorned with sparkling stones, these pieces remind us of our roots here in the Christmas City. We may not love the cold and the snow of winter, but we do love the colors of the season! Fun accessories in dark grey, winter white, and wine reds add a stylish touch to any outfit. 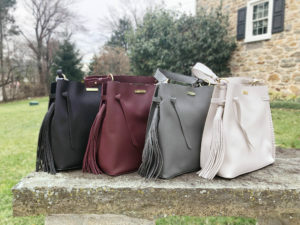 Our new Katie Loxton Florrie bags are a must-have on our list this year- we love the side tassel! 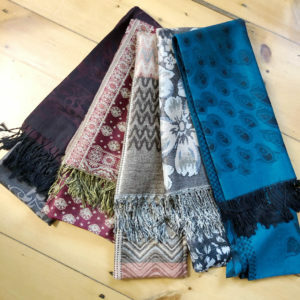 You can also never go wrong with a beautiful scarf- a pop of color adds some fun to your basic black coat! 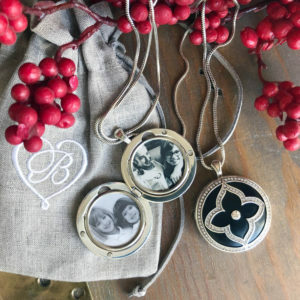 The locket is a classic way to give someone a gift that keeps their loved ones close to their heart. 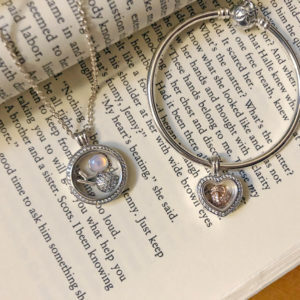 We love the new Brighton Love Lockets collection for a meaningful gift this Christmas. 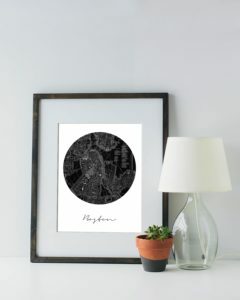 Available in a variety of styles, we are equipped with a special printer to print out a picture from your phone in-store in the exact size needed for each locket! Pandora also has a beautiful locket concept- the Floating Memory Locket. Made with scratch-resistant sapphire crystal, the open window of these lockets show off a grouping of petite charms. 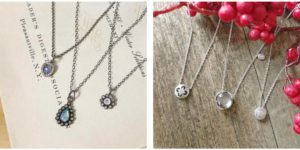 With initials, birthstones, and other love and family related charms, it is easy to make a locket the represents your love and family. 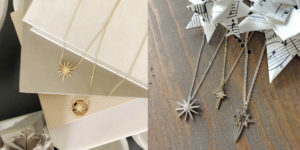 Jewelry inspired by the cosmos is everywhere this year! 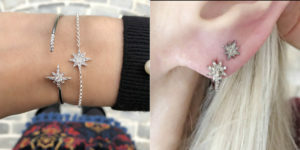 We love the dreamy feel of this jewelry, studded with sparkle and starry symbols. Waxing Poetic has made some gorgeous Limited Edition celestial-themed charms this year- we love the Dark Halo charm on the Hematite Ensemble necklace! 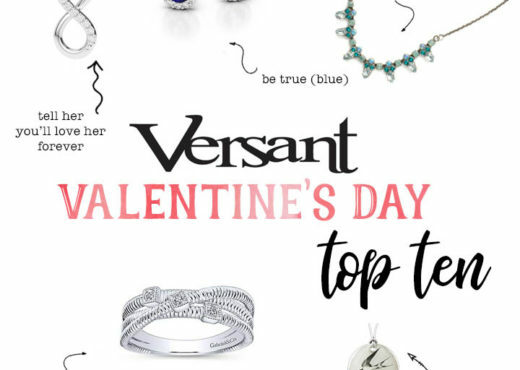 For the girl who is looking for something other than a necklace, there are plenty of options as well! 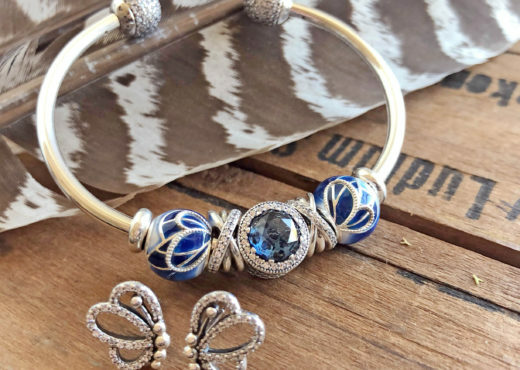 We love Pandora’s celestial themed jewelry this year. Our North Star ring is another one of our favorites! Tucked in amongst all the sparkle, we have some wonderful gifts for the men in your life too! Our new line of jewelry, Pyrrha talismans, is a favorite among celebrity men. 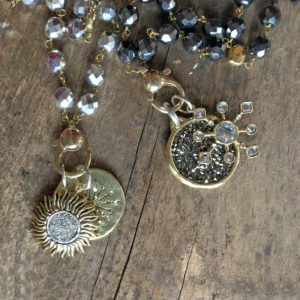 Designed from antique wax seals with a rustic, hand finished feel, these sterling and bronze talismans each have a meaning taken from heraldry. The Fatherhood talisman is a particularly meaningful gift for the new dad! Our locally made Men’s Collection Wellness bracelets are also a great gift for your guy. 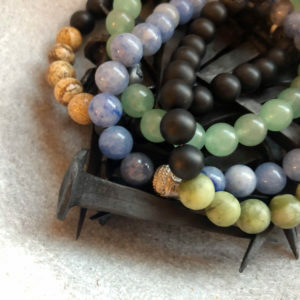 Made from natural gemstones, each 8″ stretch bracelet comes with a card describing the properties of the stone- such as giving strength to relieving stress. For the man who won’t venture into the jewelry world, we have some great gifts upstairs in Haven, too! 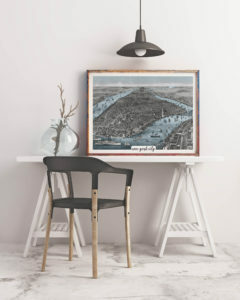 Our large map prints are great for decorating his office or den- choose a place that is meaningful or memorable for both of you for an extra layer of love! We love the way rose gold warms up any palette. 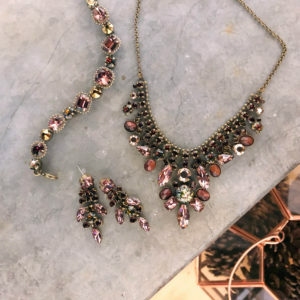 You can mix it with your silver jewelry to add a touch of blush or go all rose for a statement look. 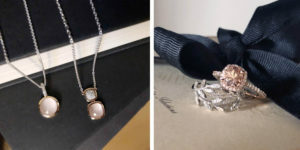 In recent years rose gold has become the “it” metal to have- get in on the trend this holiday! 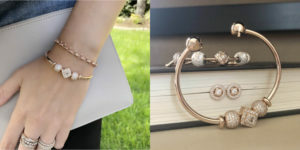 Pandora Rose reimagines some of our favorite charms and jewelry in the rose gold tone. We love the new Pandora Rose open bangle! For the girl with a more dainty style, we love this labradorite and rose gold star bracelet from WinterLemon. A gift meant to express a particular sentiment is always a good idea because it shows that time and thought were put into choosing something significant. 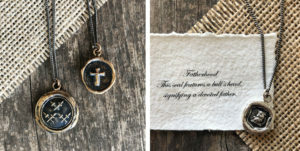 Our Talisman collection necklaces use expressive words and images to symbolize different attributes. Each Talisman comes with a card that explains the meaning behind the piece. 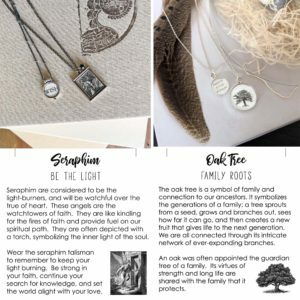 We love the Oak Tree talisman, meaning strength & family roots, and the Seraphim, a messenger of light. 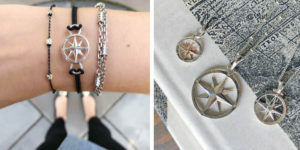 Our Compass Rose collection is also a wonderful way to bring meaning to your gift this year. 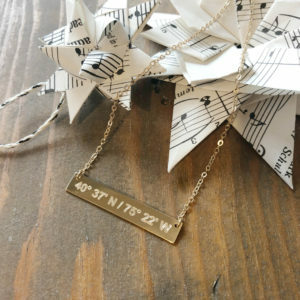 A symbol of guidance, the Compass Rose encourages us to remember that “we are not just travelers, but navigators of our future.” It is the perfect gift for someone taking on new responsibilities or directions in their life. It is also perfect for the people in our life who love to explore the world! Our WinterLemon Wellness Necklaces bring beautiful meaning to the trend of natural gemstones. Each delicate necklace comes displayed on a card that describes the metaphysical properties of the gemstone that adorns the necklace. 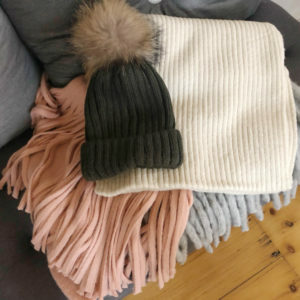 Winter is here- the season for cushy blankets and warm fires. Joy is found in things that are soft and comforting. Bring some of that cozy spirit under the tree this year! We love our coat/cardigan hybrids! Densely woven, they are well insulated and really keep out the chill. 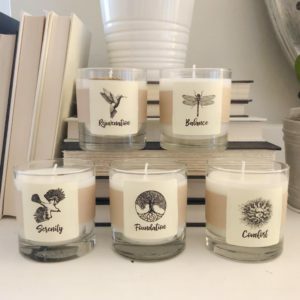 Our locally-made Essential Oil Soy Candles will help turn your home into a cozy haven. Each candle comes with a small booklet explaining the benefits of the essential oils used. Nothing brings the sparkle on Christmas morning like a touch of diamonds. This year’s trend is a dainty look perfect for layering. For an heirloom quality piece to really cherish, 14k will let your investment last for years to come. Unlike silver, which is a soft material that will wear down over time and risk losing stones, 14k gold is durable and can hold up to everyday wear. 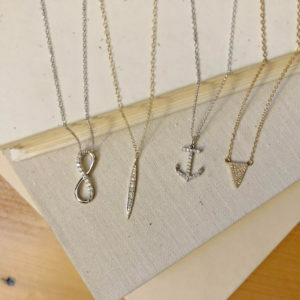 Some of our favorite delicate diamond pieces are the infinity and anchor. Simple, beautiful, and meaningful- what’s not to love? If you are on a tight budget but still want to bring the sparkle, sterling silver set necklaces are a good option. 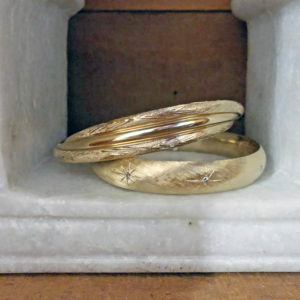 While not as durable as 14k gold, when treated with care they are a beautiful alternative. We love the look of oxidized sterling silver to make the diamond’s brilliance stand out. Nothing adds some excitement to a boring outfit like a pop of color. Bring some new energy into her jewelry by choosing a piece that makes a statement with color. For a minimalist style, keep a simple palette, like her favorite color or the color of her birthstone. For a more organic look, use natural gemstones to bring some color into her life. 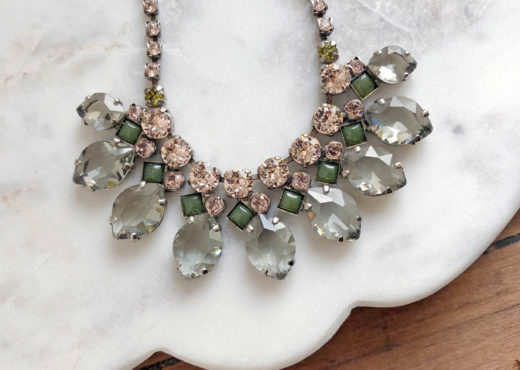 For the experts in both color and sparkle, look to Sorrelli Jewelry. Their gorgeous pieces exhibit a range of complementary colors- we love the plums, tiger’s eye, and sage greens of their Mahogany collection! While some people say that gift cards lack the emotion of a thought-out gift, sometimes what a girl really wants is an excuse to go get herself something she loves without worrying if she should really be treating herself. Want to really wow her? 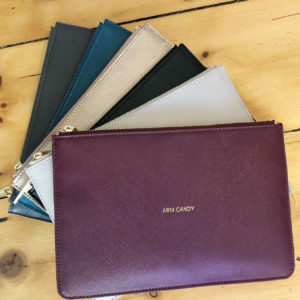 Hide it in one of our adorable Katie Loxton clutch pouches! An extra bonus for those who are last-minute shoppers- in addition to getting a physical gift card at Versant, you can get a Digital Gift Certificate in our online shop! 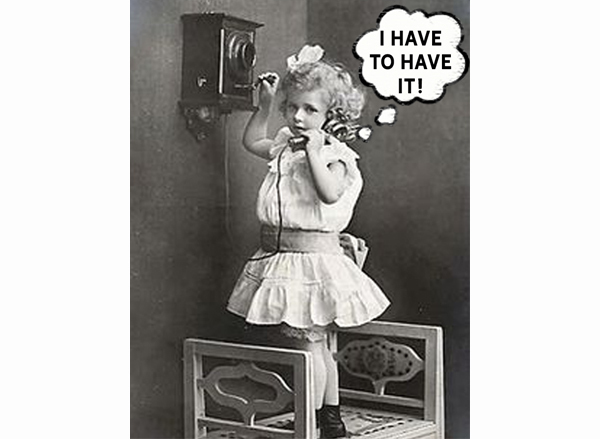 Digital Gift Certificates can be used both online and in-store at Versant. We hope this year’s 12 Gifts of Christmas guide has helped take some of the stress out of this year’s shopping! Don’t forget that you can use coupon code 12DAYS until 12/20 to get 10% off any of the items pictured in this guide that are available in our online shop! Looking for a way to leave some hints this holiday? Check out the Wish List function of our eStore- add items to your wish list and then share with friends and family through email or Facebook!